Born in Southern Ontario, Dave spent his childhood in the outdoors hunting, fishing, and exploring with friends and family. Listening to his grandparents stories of adventure in the outdoors, inspired a real hunger for knowledge, experience and personal growth. Joining Army Cadets at age 12, Toronto Scottish Regiment (infantry) at age 19, and transferring into the Regular Forces a year later. Dave served 6 years as a Weapons Technician Land (army) in CFB Val Cartier, Quebec which included a 6 month deployment as a UN Peacekeeper in Nicosia, Cyprus. In 1993, Dave challenged himself as a Canadian Forces Search and Rescue Technician (similar to American Para Rescue Jumper (PJ)) and was accepted into one of the Canadian Forces elite trades. His first posting as a SAR Tech was CFB Trenton, Ontario (424 Transport & Rescue Squadron). 6 years later he was posted to CFB Winnipeg, Manitoba (435 Transport, Air-to-Air Refueling, and Rescue Squadron). Assigned to the Canadian Forces School of Survival and Aeromedical Training (CFSSAT), Dave served 6 years as a Survival, Evasion, Resistance, and Escape (SERE) Instructor for both Basic (overt survival) and Advanced (covert survival) SERE courses. 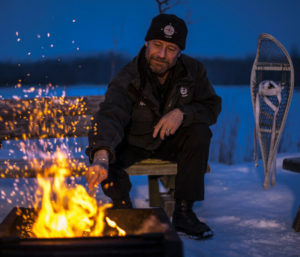 Retiring after 25 years of military service and remembering the sights seen and lessons learned, Dave created the International Canadian School of Survival Inc. (ICSOS Inc.). This school is his way to contribute to the search and rescue systems and pass on his experiences, unique skill sets and the survival knowledge contained within the military communities worldwide. If both the persons in distress and the rescuer have similar emergency training, then the rescue operation should be faster and safer for all.